A flexible labour market is widely regarded as a key factor in encouraging economic growth and prosperity. In recent years some economies have successfully reformed their labour markets, making part-time and flexible hours easier, limiting the restrictive practices of trade unions, encouraging training and the enhancement of the skills of those in the labour market, coping with the changing age profile of the workforce and in other ways. Other economies have been less successful at labour market reform and continue to struggle with outdated structures and practices. 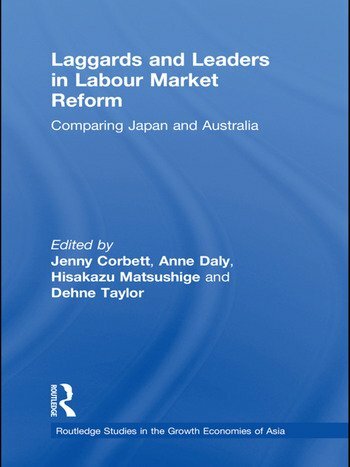 This book discusses the key elements of labour market reform, contrasting a country where reforms have been successfully carried through, Australia, with a country where reforms have been less successful, Japan. At the same time, this book challenges the conventional view that Australia is the lucky country for all its workers – given the rising hours worked for those in work and the difficulties for young people entering the labour market. Both countries also face issues in terms of an ageing population, and policy challenges in the design of safety nets and pension provision. The book thereby demonstrates to analysts of labour market reform worldwide the key elements of successful labour market reform, and the consequential effects when the reforms are carried through, or not. Jenny Corbett is Professor of Economics and Executive Director of the Australia-Japan Research Centre at the Australian National University, Australia; and a Fellow of the Nissan Institute of Japanese Studies at the University of Oxford, UK. Anne Daly is Research Associate at the National Centre for Social and Economic Modelling (NATSEM); and Director of the Centre for Labour Market Research, University of Canberra, Australia. Hisa Matsushige is Professor and Associate Dean at the Osaka School of International Public Policies, Osaka University, Japan. Dehne Taylor is currently a Visiting Fellow at the Crawford School of Economics and Government at the Australian National University. Prior to this he was Manager of the Labour Market Unit at the Australian Treasury.